For many gardeners snowdrops herald the end of winter and the start of a new gardening year. There can be little sights as cheery as the first white, bell-shaped flowers, surrounded by linear, glossy-green leaves pushing through the ground in mid winter. Although Galanthus nivalis may not be native to England, it has long been naturalised. The word galanthus is of Greek origin and roughly translates as ‘milkflower’, referring to the white coloration of the flowers, while nivalis means ‘growing near snow’. 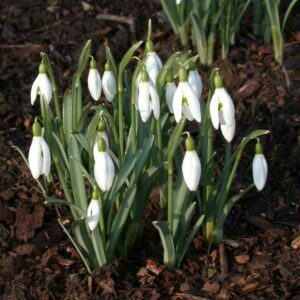 Snowdrops grow in most soils, but make the best plants in heavier, moist soils. The blooms last longer the colder and gloomier it is, so for the best display plant in light shade. Planted as dormant bulbs they often fail because they have become too dry and shrivelled. When buying dry bulbs make sure they are from a reliable nursery and are fat and hard. They can also be successfully transplanted in spring – ‘in the green’, when the plant has foliage.